Amcor flexibles' unique recloseable Amcor Tape Top packaging solution is being used to pack fresh produce for the first time. 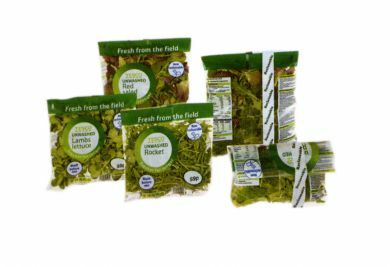 UK supermarcket TESCO has chosen the innovative concept for itsown label range of five unwashed salads. Tape Top is a patented pack concept which utilises a pre-cut band to give multiple reclosure of the pack. Tha Tape Top band can be positioned anywhere on the bag and secured to the bag with a hot melt adeshive supplied in this case by Henkel.